Bericht vom Parteitag der irischen Linkspartei Sinn Féin, der am 17./18. November 2017 in Dublin stattfand. The move is his initiative “as part of the process of regeneration and renewal” within Sinn Féin that he had discussed with the late Martin McGuinness to build on the growing strength of the republican party that he has led since 1983. It comes as part of a long-considered strategy worked out with the late Martin McGuinness and fits into the 10-year development plan that Sinn Féin has devised to be in Government North and south and its goal of the reunification of Ireland. Gerry Adams (69), a TD for Louth, also announced that he will not contest the next Dáil election. He told Sinn Féin members attending the closing session of the Ard Fheis in Dublin that he will be asking the incoming Ard Chomhairle elected this weekend to convene a special Ard Fheis in the New Year to elect a new leader. Martin McGuinness and Gerry Adams had deep discussions about when they would both step back from their leadership positions. These were overshadowed, however, by the unexpected serious illness that struck Martin McGuinness late last year and the former deputy First Minister’s death on 21 March this year. This came after Martin’s resignation from the post in January over the DUP’s involvement in the financial scandal surrounding the green energy Renewable Heating Incentive (RHI) scheme and the role of high-ranking DUP figures, including First Minister Arlene Foster. Tá failte romhaibh uilig chuig Ard Fhéis Shinn Féin. A special céad míle fáilte to Friends of Sinn Féin USA and representatives of the North American Labour movement. Best wishes to the President of the Friends of Sinn Féin USA Jim Cullen, who is seriously ill. Fáilte also to Friends of Sinn Féin in Canada. Welcome also to our comrades from Cuba, Greece, Britain, from the Basque country, from GUE-NGL and to all our foreign dignitaries and diplomats. Slán abhaile to the Cuban Ambassador Hermes and his bean chéile Ana. Solidarity greetings to the people of Palestine and the Gaza strip. Solidarity also to the people of Catalonia. Tá mo chuid cainte anocht ar son mo chara agus mo chomrádaí, agus ár gceannaire, Martin McGuinness agus do Bernie agus a clann atá linn anseo. We miss all those comrades who died in the last year. And in the decades of conflict before that. Spreagann siad muid go dtí an lá seo lena aisling. I was first elected Uachtarán Shinn Féin in 1983. The war in the North was raging but the hunger strikes two years before and the deaths of Bobby Sands and his nine comrades, had dramatically altered the political landscape. Bobby’s election in Fermanagh/South Tyrone, Kieran Doherty’s in Cavan/Monaghan, Paddy Agnew in Louth, and anti-H-Block/Armagh candidates elsewhere brought us into a new phase of struggle. In 1982, Sinn Féin won five seats in the short-lived Assembly. In June 1983, I was elected as MP for west Belfast. There were then 10 Sinn Féin councillors in this state. But 1983 also saw the first two Sinn Féin councillors elected in Belfast and Omagh. These were modest but important advances. Republicans had been at the heart of a culture of resistance – correctly standing strong against the brutality of the British state. Our leadership set about transforming that into a culture of change. In my first Ard Fheis speech as Uachtarán Shinn Féin I said that we had to develop radical and practical alternatives to the militarism and oppression of the British in the North, and to the Tweedledum-Tweedledee policies of Fine Gael and Fianna Fáil in this state. We needed an all-island struggle. I warned against Sinn Féin activists standing on the sidelines ‘separate from and isolated from the people’. That imperative holds true today. I contended then, as I do today, that the economy should serve the people – not the other way round. That struggle for equality and fairness continues. And Sinn Féin is now in the leadership of that battle. Twenty years ago, Caoimhghín Ó Caoláin was our sole Teachta Dála in Leinster House. Fear maith, Caoimhghín, agus bean iontach Briege. Now we have 23 TDs, 7 Seanadóirí, four MEPs representing all parts of this island, 27 MLAs, 7 MPs, and over 250 councillors. Today, over half a million people vote for Sinn Féin. The perpetual unionist majority built into the gerrymandered Northern state is gone. Ba mhaith liom sibh uilig a thréaslú as cuidiú chun seo a bhaint amach. If I was asked to measure the successes of Sinn Féin, I would say judge us on the changes we bring about. That is what Sinn Féin is – the republican party for positive change and equality for the people. Who here remembers Margaret Thatcher? For many of my generation she will be forever linked with the Hunger Strikes. But she was more than that. Her right-wing Conservative government increased poverty and destroyed lives. Thatcherism was for tax breaks for big business and the elites. Thatcher was against workers’ rights – against public services. Recognise the similarities? Thatcher is gone but her legacy lives on in our Taoiseach. His republic is limited to 26 counties and extends only to those who get up early to go to the gym, on the way to a highly-paid job, with big expenses and a gold-plated pension. But Sinn Féin makes no apologies for also standing with those who get up early to commute into cities where they cannot afford to live. We stand with those who get up early to drop their children to school or the child minder (if they can get childcare). We stand with those who care for sick friends, neighbours or family. For those living in rural Ireland without proper services and opportunities. For those unable to work. Sinn Féin stands with those who work long hours for low pay. Or struggling to pay health costs. Taoiseach Varadkar’s ‘Republic of Opportunity’ is a mé féin republic. How can Micheál Martin say he is for an Ireland for all when he is propping up a government for the few? Their conservative mé féinism is a million miles away from the vision of the 1916 Proclamation. A genuine republic would not allow over three thousand children to be homeless. It would not allow patients, many of them elderly, some of them vulnerable children, to be left lying on hospital trolleys. Or the six hundred thousand people on growing hospital waiting lists. A genuine republic would support citizens with intellectual or physical disabilities, and their families. A genuine republic would not tolerate disadvantage and inequality. Sinn Féin has a different set of core values. We believe in equality and solidarity. Sinn Féin believes that society must be shaped so that all citizens can achieve their full potential. That includes citizens in rural Ireland. Our party makes no apologies for supporting public services, including a genuine public health service across this island. We believe in everyone’s right to a home. We also want to extend the vote in Presidential elections to the North and the Diaspora. Sinn Féin fully supports the repeal of the Eighth Amendment. Women and their doctors need legal protections. Women deserve and are entitled to be trusted and respected. Brexit is the single greatest threat to the Irish people in generations. That is why Sinn Féin opposed it in the referendum and why we have consistently called for ‘Special Status for the North Within the EU’. I commend our spokespersons on the issue and especially our team of MEPs who, unlike the Irish Government, have shown real leadership. The Government has only recently wakened up to the reality that Brexit on British Government terms is not acceptable. It will be disastrous for Irish business and farming in every part of this island. It will destroy the rights of Irish citizens in the North. It is not compatible with the Good Friday Agreement. Leo Varadkar needs to stand up for the interests of all the people of the island. He has a veto. He must use it. Since March, Sinn Féin, led by Michelle O’Neill, has been working hard to restore the political institutions. We want to deliver for everyone in the North on the basis of respect, tolerance and equality. The denial of modest rights would not be tolerated in Dublin and London. And it won’t be tolerated in the North. The DUP’s opposition to these basic rights means there is no Executive. The British Government has been complicit in this. Through her pact with the DUP, Theresa May has prioritised her own political survival. We met the Taoiseach this week and we will meet the British Prime Minister next week. We told Taoiseach Varadkar that it is now time for the governments to act. If the Executive is to be re-established the role of the Irish Government will be decisive. It can be neither neutral or neutered on this matter. These issues aren’t going away. The only way forward is through honouring agreements, not breaking them. No British government has any right to any involvement in Irish affairs. But until the British Government leaves our country, the least they can do is to deliver on their obligations. And the least on Irish Government can do is to insist on this. Good Friday AgreementThose of us who want a united Ireland must articulate that view clearly, and in the context of the Good Friday Agreement. And we have to persuade our unionist neighbours to support a new and agreed Ireland in which Orange and Green can live together in prosperity and harmony. An agreed Ireland has to guarantee unionists their rights. The future is for the people to decide – peacefully and democratically. Several months ago, I wrote to the leaders of the political parties and the Independents in the Oireachtas, proposing the establishment of an all-party Oireachtas Committee on Irish Unity. The Fianna Fáil leader has rejected this. So too has the Taoiseach. Why? Isn’t it telling that the leader of Fianna Fáil, ‘the Republican Party’, and the leader of Fine Gael, ‘the United Ireland Party’, are preventing the Oireachtas from discussing the future of this island? So, what will Sinn Féin do? Sinn Féin will bring forward a White Paper on Irish Unity. Sinn Féin will make the aim of a new agreed Ireland a primary focus of any government we are part of. 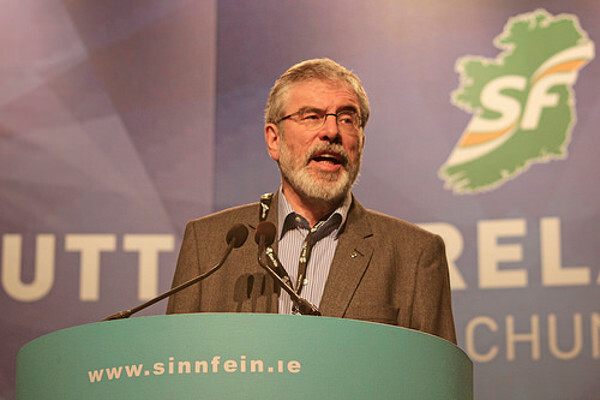 Sinn Féin will campaign for a referendum on unity to be held in the next five years. Don’t let Leo or Micheál try to convince you this is not right or achievable. And it will be achieved. Sinn Féin will be in government in the North if and when there is agreement. We need to prepare also for being in government on republican terms in Dublin. Go cinnte, braitheann seo ar an méid Teachtaí Dála a bheidh tofa againn. The Fine Gael and Fianna Fáil leaderships, the Dublin establishment, including the Independent Media Group, don’t want Sinn Féin in government because they and their cronies have run this state for nearly 100 years in their own interests. They know we will bring an end to corruption, cronyism and gombeenism. They know a government with Sinn Féin leading it will be an accountable government. It will be a government grounded in basic, common decency. If somebody is in trouble, it will help them. If somebody has fallen down, it will pick them up. Má tá duine ann gan tintáin, beidh foscadh ann dóibh. That’s the sort of government that is needed. A government of equality and fairness. I am very proud to have served Sinn Féin as Uachtarán since 1983. Of course, before our time there were leaders who kept the flame alive. We are also very conscious that 20 of our members were murdered during the conflict. We are indebted to them and their families. Last year, Martin McGuinness and I said that there was a plan for change in the party leadership as part of the process of regeneration and renewal. Ten years after entering government with Ian Paisley, Martin’s intention was to step down as Deputy First Minister on May 8th. Then life punched us in the face. Martin’s illness and the ‘Cash for Ash’ scandal brought that date forward. Martin was a leading member of our leadership team. I have been enormously privileged to be part of an amazing and evolving collective leadership. It has included in times past, in hard oppressive times and in different phases, men and women like Máire Drumm, John Joe McGirl, Joe Cahill, Rita O’Hare, Lucilita Breathnach, Mitchel McLaughlin, Danny Morrison, Pat Doherty, Martin McGuinness, Tom Hartley, Caoimhghín Ó Caoláin, Jim Gibney, Ted, Dessie and Dawn, Sheena Campbell, Seán MacManus, Martin Ferris and many, many more. Some of them remain active today, along with many others – too many for me to acknowledge tonight. But may I say I am delighted to see many of you here, especially Councillor Joe Reilly. Many comrades have given their entire lives to our struggle. They saw beyond the hardship of the moment and embraced hope. That resilience, like the Peace Process, is opposed by those who uphold the status quo. But, despite them and their mean-minded petty vindictiveness, we have prevailed. One of our great achievements has been, with John Hume and others to build a peace process. We have also recast Sinn Féin into an effective all-Ireland republican party, with clear policy and political objectives and the means to achieve them through democratic and peaceful forms of struggle where none existed before. Republicanism has never been stronger. We will grow even stronger in the time ahead. But leadership means knowing when it is time for change. Neither will my friend and comrade Martin Ferris. I want to thank Martin, Marie and their clann for his years of service to the Republic. This is also my last Ard Fheis as Uachtarán Shinn Féin. I have always seen myself as a team player and a team builder. I have complete confidence in the leaders we elected this weekend and in the next generation of leaders. I want to thank everyone who has welcomed me into their homes and communities and who have made me part of countless campaigns, countless elections and countless negotiations. I want to especially thank the people of west Belfast, and the people of Louth, including Richard McAuley, for your unswerving support and solidarity, and your friendship. I firmly believe that one person can make a difference. The first step in making a difference is believing that you can be that person. One woman – one man – doing their best. You don’t have to do as much as Martin McGuinness did but we all have to do our best – and we have to do it together. That is the key to our successes so far. Doing our best, moving forward, united, strong and together. Na habair é – dean é. You are the makers of the future. You are the nation builders. Finally, my thanks to Colette. We are now married 47 years. There have been ups and downs – the Prison Ship Maidstone, Belfast Prison, Long Kesh, the H-Blocks and years of life on the run. But love has prevailed over everything life has thrown at us. We have been blessed with Gearóid, the best son anyone could wish for, and Roisín the best daughter in law. With them came Drithle, Luisne, Anna and Ruadan na gar paistí is fearr sa Domhain. Is mó ghrá sibh uilig.